Here it is, the second edition of the most unique wine being made in el marco. 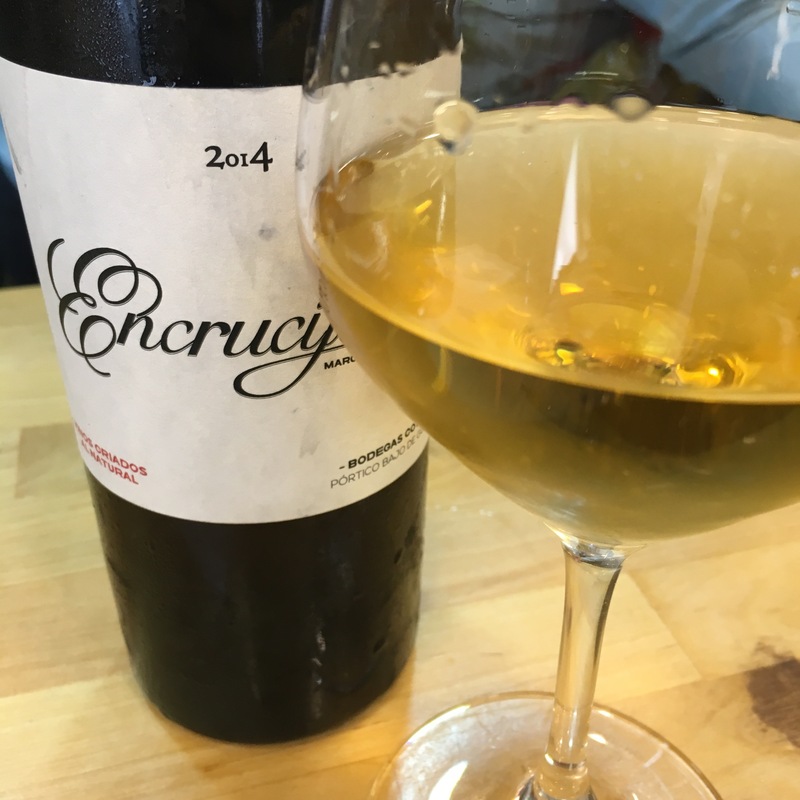 It is by Ramiro Ibañez‘s Cota 45 label and is an evolution of the Encrucijado 2012: whereas that was 50% palomino and had six varietals in total (10% each of Beba, Cañocazo, Mantuo Pilas (aka “Uva Rey”), Mantuo Castellana and Perruno) this is 40% “Uva Rey”, 40% Perruno and only 20% Palomino. The fruit was dried in the sun for two days to bring up concentration, fermented in bota, given a couple of months on the lees and then two more years in bota – including four months or so under flor. I am not sure of the historic back story but the back label has a reference to the old classifications of rayas, palmas and cortados, of which this would presumably be a cortado. Dark gold in colour and has a spirity, honeysuckle, overripe melon nose. It is fat in texture for a two year old wine and on the palate it has an initial dash of that overripe melon but quickly turns to a grapefruity citrus. It seems more potent than my memory of its predecessor with less butterscotch, more grapefruit bitterness, and more obvious alcohol. However it is sharper in its features and has a more defined, elegant structure to it: there is just a little bit of acidity (some esparto grass from the empty glass at the end?) and a nicely integrated salinity leaving a mouth watering, fresh finish.